The holidays are almost here..and shopping has begun to find gifts for your loved ones. I will be doing two parts for this post. This one is for the ladies in your life and the next one will be for the men! I hope this helps all of you who are looking for gifts to buy! Burberry Scarf: You can never go wrong with a scarf, especially a gorgeous one from Burberry. These are a little pricey, but last forever and are super warm. They aren't too bulky either and can be worn with everything. I love this red one because it's great for Christmas! The scarf doesn't have to be a super expensive one either. TopShop, Forever21 and Nordstrom make other great scarfs which would be a great gift. Diptyque Colored Glass Candle Trio Set: A candle set is perfect for any lady. I love candles and I don't know anyone who doesn't. This set is a limited edition one for the holidays that come in amazing scents, as well as these gorgeous bottles that can be re used. Diptyque candles are amazing in quality and any girl would love to own one. Kate Spade Odds and Ends Dish: For a homely girl who likes quirky cute things, this dish is perfect to put right near your front door or next to your bedside table to put jewelry or your keys. I have a dish like this where I place my rings so I don't lose them. There are various ones you can get beside this one. A ton of options like these dishes are available by Kate Spade. Fujifilm Instax Mini 8 Mini Film Camera in Turquoise: For a tech lover, this is such a cute thing to have. I love Polaroid camera pictures. They are so adorable and because this is a digital age, it's so nice to have a real printed photo. I have been wanting one of these forever and I love this color. You can display it in your apartment too and they are so simple to use. There are more colors as well. Mejuri Evil Eye Ring: I am a ring hoarder and Mejuri makes the most beautiful dainty rings. I love evil eye stuff and of course it has one of my favorite colors, turquoise! I think any lady would appreciate this one. It's a gold chain ring which is unlike any other typical ring. I would love to get this as a gift and I'm sure any girl would! Hourglass Ambient Lighting Edit Palette: For the lady who loves makeup and beauty, this is a great gift. These ambient lighting powders are so buttery and beautiful. The quality is on point and has a perfect mix of blushes, powders and bronzer all in a cute palette. Trust me, if your girl loves makeup, she will love this! There are six shades in here that all work well with every skin tone! I highly recommend it! Nopi Cook Book: For the girl who loves to cook or I guess a girl like me, who loves food, this is one of the best cook books out of the lot. Yotam Ottolenghi and Ramael Scully are authors of this mouthwatering book. Nopi is a very famous restaurant in London co-owned by Yotam and Ramael(who is the head chef). This book has a great variety of foods and is worth having! The pictures are like no others and make you want to cook tastier meals. Rayban Icon 50mm Sunglasses: Sunglasses is also an awesome fashion gift. These are so sleek and I love how unique they are. Unlike the typical Rayban's, these ones are round and mirrored! It comes in a bunch of colors, so you can easily pick what she would like. Birchbox: I think subscription services are perfect when you are not sure what to get someone. This can be great for a friend, your sister or even your mom. Every month you get a box in your mail with 3-5 deluxe beauty/skincare samples from a variety of brands. It's like getting a little gift every month! Who wouldn't like that?? Ear Critter Faux Shearling Slippers: Baby, its cold outside, and why not warm up your feet with these adorable faux shearling slippers. I used to have these and they are so warm and cozy for the winter. P.S. 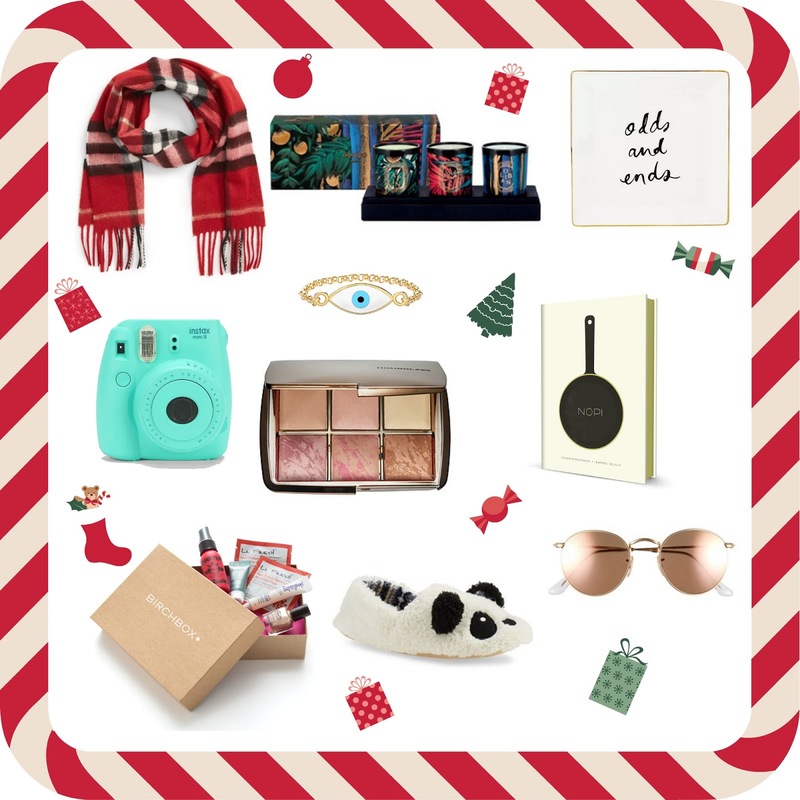 Most of these gifts are on sale right now! So go grab the deals online or in stores! I hope this helps some of you! What is your favorite gift out of these?